Do you love strawberry salad? 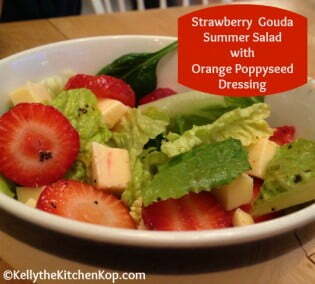 Wait'll you try this strawberry gouda summer salad!!! 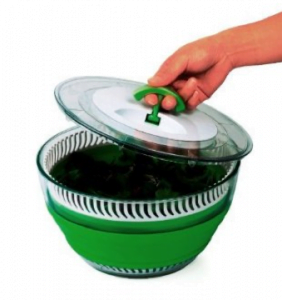 First though, here's my salad spinner, which I loooooove… The kids fight over spinning it, of course, but the bowl is cute and a perfect size for a summer picnic. It's also collapsible to save space! The best part is that it actually works, my last one was a piece of junk — it's funny how you appreciate the little things sometimes, huh? Big bunch of your favorite crunchy lettuce, rinsed, drained and torn. I like organic romaine with a nice mix of other greens, too. Nancy's recipe also calls for spinach, and a little raw spinach now and then is no big deal, unless you have health issues, but here's why you don't want to make eating raw spinach a daily habit, such as in a morning smoothie… It contains something called oxalic acid, which blocks mineral absorption. Read about other veggies that should be lightly cooked before eating from Sarah. Also, here’s more info from Dr. Kaayla Daniel: Plants Bite Back. 1 quart organic strawberries, cleaned and sliced – strawberries are always high on the dirty dozen, right now it's number two, which is why buying organic is important. Whisk dressing ingredients well and pour over salad ingredients. Let me know if you love it, too! Did you make a real food recipe? I want to see it! Tag @KitchenKop on Instagram and hashtag it #KitchenKopRecipes OR share anything you know I’ll love by tagging @KitchenKop and hashtag #KitchenKop -- see you over there! 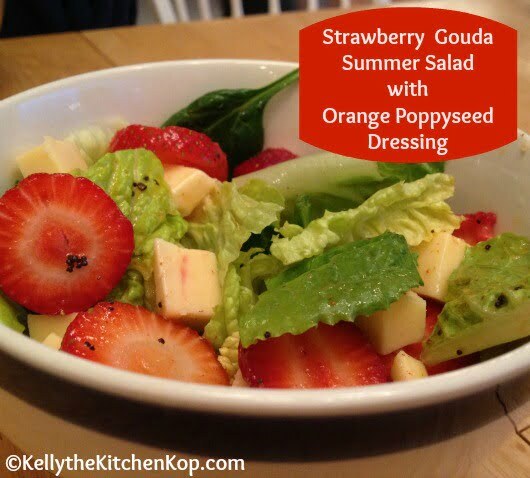 Click here for many more yummy salad recipe ideas! I had a salad yesterday with Strawberries and Arugula, it was quite good. I never thought those two would go together. We are stopping doing GAPS intro after 2 days. My daughter was having great struggles with blood sugar levels despite eating the foods. We are not a severe GAPS family (eczema, 1 child has milk allergy, and that is it). My husband felt it was too much for our family and not wise to continue. However, it did make us stop and realize how much we have been beginning to go back towards easy fixes and reliances on grains (sourdough pancakes, homemade cold cereal, soaked beans and white rice) too often. So we will be tweaking our diets towards where it should be again. It is amazing to realize how much we have fallen off so to say. A part of me is embarrassed to admit that we have already stopped but another part realizes it is not a competition and there needs to be no embarrassment. All of this too say, that I am looking at your salad, with my mouth watering…it is going to be dinner tonight! My, oh, my, does that salad look good! I think that will be on our menu soon.